Over the past 25 years, the trailblazing, nearly-telepathic trio of keyboardist John Medeski, drummer Billy Martin, and bassist Chris Wood has developed its own potent language based on equal allegiances to the groove and the avant-garde. Here they collaborate with the 20-piece classically-oriented new music collective Alarm Will Sound. Though seemingly operating in different orbits, these two musical forces come together on a collaboration recorded live at The Newman Center in Denver, Colorado in February 2015. Expansive pieces like the 14-minute “Kid Tao Mammal (Unworldliness Weirdo),” written by Alarm Will Sound percussionist Payton MacDonald, and Medeski’s 19-minute “Eye of Ra” find the two entities merging chamber and improvisational elements in organic fashion. Two old MMW tunes—Medeski’s Hammond B-3 organ feature “Anonymous Skulls,” arranged by violinist Courtney Orlando, and the grooving, Wurlitzer electric piano-fueled “End of the World Party (Just in Case),” arranged by cellist Stefan Freund—get radically new treatments here, courtesy of cello, strings, and vocal choir. MMW drummer Martin explores cymbal colors and textures on his cinematic rubato number “Color Sea,” which showcases AWS cellist Freund playing alongside Medeski’s sparse accompaniment on Wurlitzer. Violinist Caleb Burhans’ delicate “Oh Ye of Little Faith…(Do You Know Where Your Children Are? )” is a minimalist gem, though it’s difficult to suss out any input from MMW here. “Northern Lights,” a composition by Alarm Will Sound bassist Miles Brown, is another one where it’s hard to hear the complete marriage of both bands, other than the presence of a Medeski organ solo in the middle of the piece. But the direct hits far outweigh the misses throughout this intriguing double vinyl album. 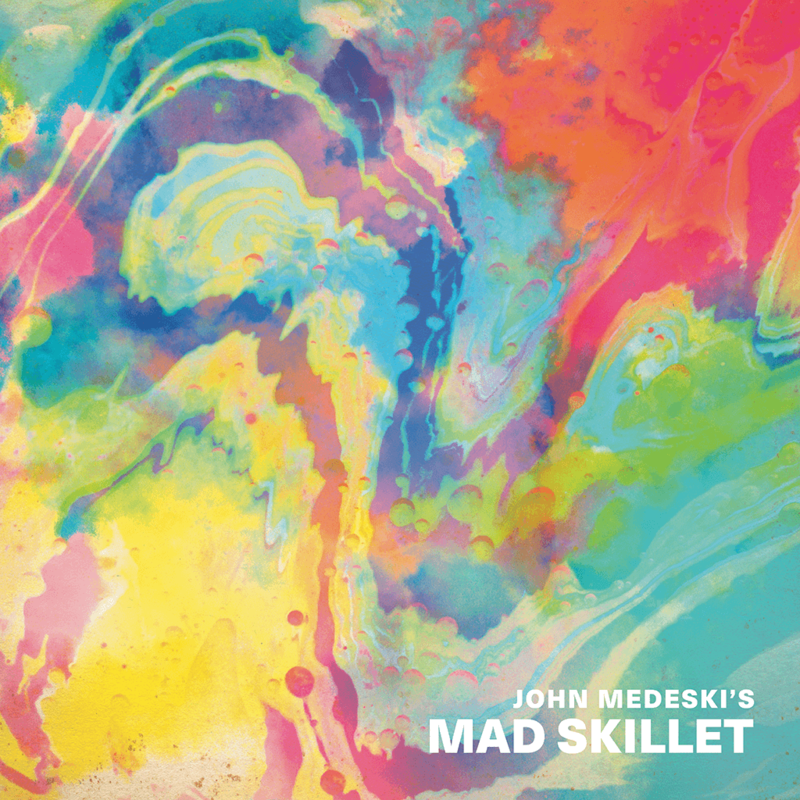 Mad Skillet, Medeski’s “other band,” feeds his greasy, groove-oriented instincts while inspiring intrepid moves on the dance floor. A quartet featuring former Dirty Dozen Brass Band members Kirk Joseph on sousaphone and Terence Higgins on drums with Will Bernard on guitar, this party-time aggregation is in the mold of other N’awlins bands like Galactic and Trombone Shorty & Orleans Avenue, only two times funkier. While the band originally came together at a late-night club set during the 2015 New Orleans Jazz & Heritage Festival, Medeski’s relationship with Joseph and Higgins goes back to 1995, when he produced and played on the Dirty Dozen’s Buck Jump. Recorded in New Orleans, this nine-track offering includes the catchy Hammond B-3 organ-fueled “Invincible Bubble” and an avant-surf take on Sun Ra’s “The Golden Lady.” Medeski’s exhilarating “Piri Piri” has him doubling boppish piano lines alongside guitarist Bernard on the tricky head while the wildly adventurous “Psychedelic Rhino” has Medeski tweaking tones and textures on a whole bank of keyboards. Bernard’s Meters-esque groovers “Man About Town” and “Little Miss Piggy” are strictly right in the pocket while Kirk Joseph offers something more experimental with his spaghetti western/dub number, “Adele,” with Medeski on melodica. Quirky yet still undeniably funky, thanks in no small part to that New Orleans rhythm tandem of Joseph and Higgins.